Video: First glimpses of the Eleuke in action! Well, my Eleuke arrived on Friday and I've been as giddy as a schoolgirl ever since. 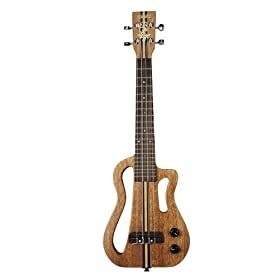 For those for those of you who don't know what an Eleuke is (shame on you, you mean you aren't hanging on my every word?) check out my "Everybody, meet Eleuke (and a rad Pedro da Silva video)" post. I imagine that this will be the first of several videos talking about the Eleuke and showcasing what it sounds like. I was in such a rush to do this video that I didn't even leave my office. The down side to that is that the only amp I have in my office is a wimpy little guy, but it'll give you an idea anyway. Tomorrow I'll run the Eleuke through my Fender SuperAmp and various pedals (Electric Mistress, Marshall Guv'ner, etc.) Maybe I can even run through a song with my Heavy New Wave band, Volumen. I'm thinking Misfits (Maybe Halloween? ), but we'll see what I can talk them into. Just holding the Eleuke is pretty soothing for some reason. I think I am so used to playing Electric Guitar that the smaller body and weight of an electric instrument feels more natural to me. 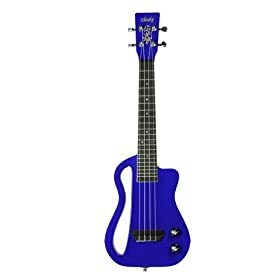 So, if you spend more time on Electric Guitar than you do on Acoustic, then you might have a similar experience with this Electric Ukulele. I have to say that I'm pretty impressed with the Eleuke, overall. Sure, It's the first solid body electric ukulele that I've played, but to be honest, there aren't really that many of them out there. It's well constructed, sounds great and the design is really interesting. It's also hard to believe that it's only $220. That seems like a scream of a deal. Anyway, enough of my jawing. Here's the first of what I hope to be a long string of videos showcasing this little number. Posted on February 9, 2010 September 30, 2016 Categories Ukulele Deals, Ukulele News, Ukulele VideosTags electric ukulele, eleuke, eleuke review, mp3 ukulele, ukulele reviewLeave a comment on Video: First glimpses of the Eleuke in action! I know what you are thinking, though? What does a $200-250 electric ukulele sound like? Well, here's an answer, in video form. This is Pedro da Silva pretty much melting faces with an Eleuke (Mahogany, I think?). Anyway, expect more posts about Eleuke in the coming days. I'm pretty intrigued by the MP3 input on the Uke. I'm trying to think of weird ways in which to make use of that. So, hopefully I'll have it figured out by the time I test drive it. Here's more information for those who are interested.